Walking safely is a basic human right since the United Nation Declaration of Human Rights guarantees that "Everyone has the right to life, liberty and security of person" (Article 3), and that "Everyone has the right to freedom of movement " (Article 13) (see here). But walking along streets and roads is often not safe or pleasant due to the presence of motor vehicles, traveling at lethal speeds. The bar chart plots DfT figures for risks per km taken from table (RAS53) of the DfT annual report - available from https://www.gov.uk/government/statistical-data-sets/ras53-modal-comparisons - or from here. 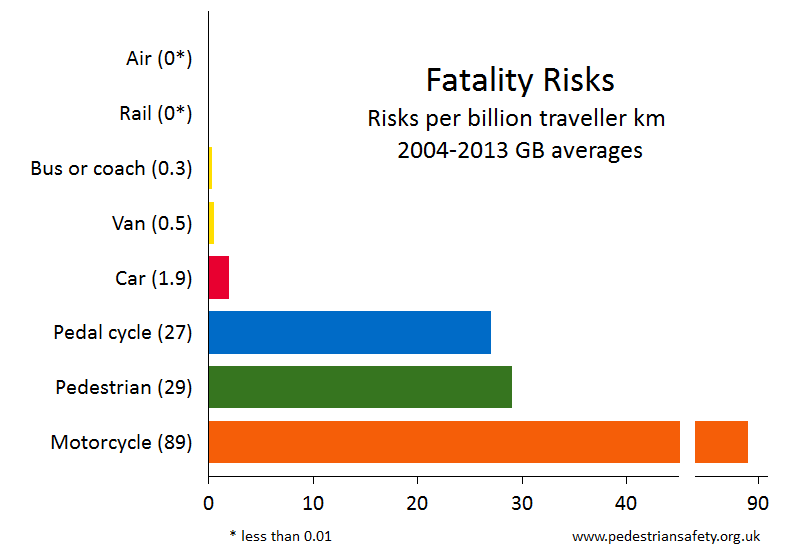 So, on average, walking is the second most dangerous mode of travel, second only to travel by motorbike.